Wink Wink Ink is celebrating their first birthday. Head on over to this cool blog and check out the festivities that are going on all month long. 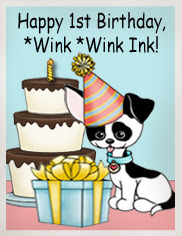 Thanks for joining our *Wink *Wink Ink 1st Birthday Party and thanks for helping spread the word! We sure appreciate it!